Mario and friends are back for another tennis match. It's been 8 years since a new Mario Tennis game has graced our Nintendo consoles, and frankly, that's 8 years too long. Mario Tennis games have been unanimously fine-crafted, and the portable entries in the franchise are no exception. When a Mario Tennis game is featured on a portable console, it's expected to be an excellent tennis-RPG hybrid, a combination that is just insane enough to turn out awesome. And regrettably, with the release of Mario Tennis Open, the trend of RPG excellence that portable Mario Tennis games offer has been broken. That said, Mario Tennis Open is far from being a bad game. Camelot, the game's developer, have been at the helm of the series ever since Mario Tennis on the Nintendo 64, and they've done a fantastic job at creating a tennis game that feels downright good to play. However, the approach they've taken with this title is significantly less Mario-like than other entries in the series. Nothing about the main game is over-the-top or whimsical. In fact, the removal of the physics-breaking “Power Shots” introduced in Mario Power Tennis have left the game feeling like a beautiful, enhanced port of the Nintendo 64 entry. Fortunately, Mario Tennis is a great title to grasp inspiration from, and Open plays and feels just as great as the other entries. Mario Tennis Open features a few additions to the series, the most important being color-coded shots. When the ball is returned by the opponent, a colored circle may appear on the player's side of the court. Each color, six in all, correspond to either a single button, or a button combo, and in order to fully take advantage of the shot, the player must stand within the circle on the court. The addition of this new play type is certainly a game-changer, and with the subtraction of Power Shots, it brings the series back to relying on the skill of the player rather than over-powered games of chance. Following the course of the first game, each of the sixteen characters fall into different class types: All-Around, Technique, Speed, Tricky, and Power. These categories define each character's play style exactly as they sound, and the difference between each is definitely noticeable. The second noteworthy addition is the option to play as one's Mii. Rather than falling into the aforementioned classes as the other characters do, Mii's are a blank canvas to be painted by different outfits, each containing skill set variations. These outfits are comparable to Mario Kart 7's different kart parts, allowing for complete customization and a Mii that truly reflects the player's preferences. In a way, this feature is a shadow of the RPG elements in the Mario Tennis portable offerings of yesteryear, but a shadow nonetheless. Aside from the main tournament play and quick-match offerings, Open features a few side challenges that alter the game of tennis: Ring Shot, Super Mario Tennis, Galaxy Rally, and Ink Showdown. These special games all have a unique set of rules, and are the only method of obtaining coins to buy the Mii outfits unlocked in the main game. A nice diversion in their own right, there's little draw to keep the player coming back to routinely play these special modes other than earning coins. Even then, the coins are only used for unlocking Mii outfits, so if one isn't particularly encapsulated with Mii play, there's almost no reason to play these special games. However, Super Mario Tennis is an exception. 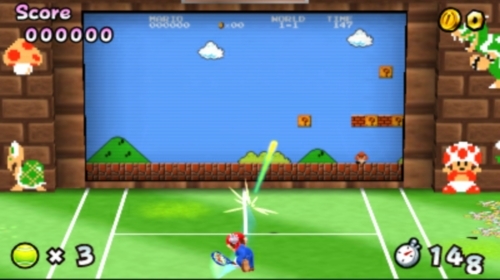 The aptly-named Super Mario Tennis projects select reworked levels from the original Super Mario Bros. onto a screen at the other end of the court, and has the player hitting the ball at the screen, thus affecting what's happening in-game. 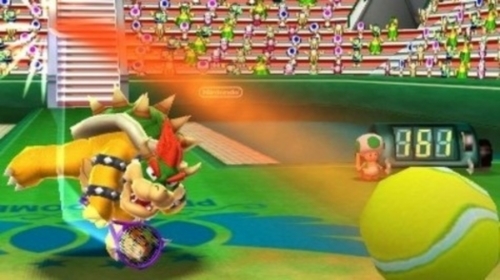 The tennis ball takes Mario's place, and the courses are on-rails, allowing progression through each stage to be dependent on how many objects and enemies the player can hit. It's really a fun take on the original Super Mario Bros. concept, and is addicting enough to warrant subsequent revisits. 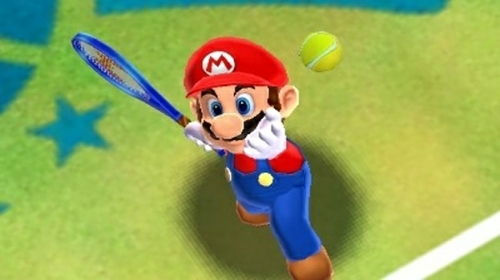 Mario Tennis Open's graphical offerings are some of the best yet on the 3DS, and each character is uniquely animated to suit their personalities. Unlike most in-house developed 3DS games, Open's 3D effect is barely perceptible, and doesn't add any new layers of immersion. The music of the game doesn't really make an attempt at standing out either, with only a few new tunes among recycled assets from previous Mario and Mario Tennis titles. Because Mario Tennis Open has been developed for the 3DS, it takes advantage of the handheld's features. The 3DS has a gyro-sensor, which means it can utilize movement of the system as another control method. 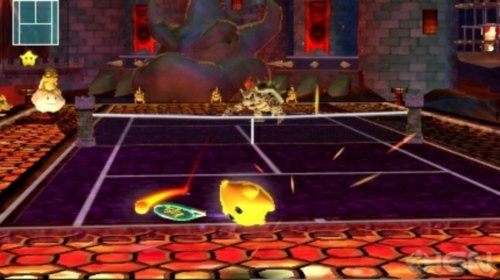 For Mario Tennis Open, holding the system horizontally presents an angled view of the entire court, whereas holding it vertically zooms the camera behind the player's back, allowing the view to be aimed left and right by tilting the system. The latter camera option has been intended for use with stylus play, as the bottom screen of the 3DS features every swing-type available through touch. This was clearly intended for beginners, as it makes the more technical shots readily available with minimal effort. Thankfully, the option of turning off the gyro-sensor is included, as the two options seem to fight for the player's attention mid-match, which leads to frustration and disorientation. With all things considered, Mario Tennis Open has all the makings of a quality title, but it's lacking that special formula that keeps the game fresh as a single-player jaunt. As the game is on a portable, most of one's time with the game will be spent in it's single-player offerings, but Mario Tennis Open feels like a game better suited on a home-console with a friend or two. The sting of no story mode, or anything resembling an RPG, is sure to leave longtime fans grasping for a game of more girth to warrant the $40 price tag. Are there hours of fun to be had here? If one really likes tennis, and goes into the game without preconceived expectations, absolutely. However, waiting for a lower price tag might be a better idea. As a tennis game, Open does the job quite well; easy to pick up and great to play. Fun, but forgettable side-games and online multiplayer make an attempt at filling the void left by the removal of a story mode, but the thought of how much better the game could have been is sure to linger in the player's mind. In a word, gorgeous. Up to par with the standards set by other triple-A 3DS titles. Vibrant, colorful, and fluid animations make the game a pleasure to view. Classic Mario Tennis with the tight controls the series is revered for. The casual crowd is catered to as well, with easy access to tricky shots on the lower screen, available with the tap of a stylus. No complaints here. It's hard not to stress how important the RPG mode was in previous handheld offerings, and with Mario Tennis Open, Camelot have taken away one of the series' highest selling points. Little explanation is given as to why they made this choice, as it feels all but regressive for the series. Open would feel great on a console as a primarily multiplayer experience, and the fact that it isn't allows what's missing from the game to be ever-present.